Looking for easy care plants and flowers for gardening areas? 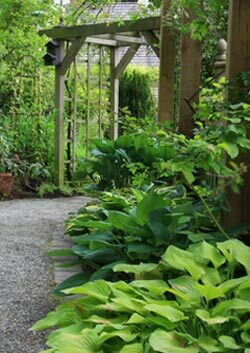 Good low maintenance plants to begin gardening with are also perennial in nature. 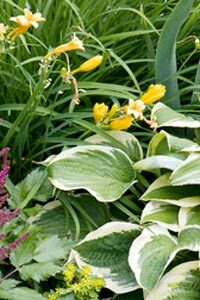 Typically, perennials are planted in your garden and live there forever. Although they die back each winter, they will grow back in the spring without needing to be planted new each year. The flowers and plants listed here will grow quite well in USDA Hardiness Zones 3-9. Zones 3-9 have an average temperature of around 50° F (about 10° C) and typically have a good average rainfall of about 30-60 inches (75-150 cm) per year. When possible, buy your garden flowers and plants already growing in pots rather than trying to grow them from seeds. By using potted flowering plants you'll have a good idea of what the flower or plant looks like before you plant it in your garden. Listed below, in general bloom order during a season, are some easy-to-grow, easy-to-maintain flowers and plants. Read more about them and take a look at some pictures to see which ones you might like to plant in your garden areas. * Start off the color in your garden each spring with some of the beautiful tulip flowers available. Add to the tulips an iris or two for later in the spring. * Next you'll want to choose some form of groundcover to help keep down the weeds. * Add some accent by using an ornamental grass or two and maybe a couple of hosta, also. Adding a variety of foliage plants is an excellent way to give your garden extra eye-appeal. * For that mid- to late-summer color, you'll want to plant a daylily or two. There are so many flower shapes and sizes, it'll be difficult picking just one of these beauties for your garden. As summer begins to turn from fall into winter, you can leave your ornamental grass stalks standing to provide interesting contrast should you be in an area where snow will cover your garden. There are plenty of other perennial easy care plants you can add to your gardening areas also. Feel free to branch out and add more variety in your flower and plant selection as you feel you are ready. By choosing from this large selection of beautiful easy care plants and low-maintenance flowers you'll soon be on your way to gardening quick 'n easy.